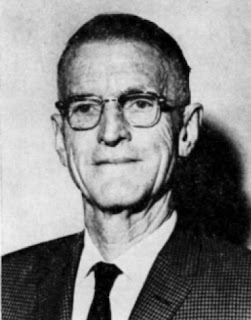 In 1937, geologist Eldred Dewey Wilson coined the phrase ‘Mazatzal Revolution’ to describe mountain building along the western edge of the North American craton. While the Mazatzal Revolution occurred in the Proterozoic - more than 1.6 billion years ago - it continues to influence Arizona geology and mineral exploration to this day. Wilson’s 1937 Ph.D. research is now available online for the first time. In about 1920, twenty-two-year old Eldred Dewey Wilson joined a handful of geologists - N.H. Darton, Carl Lausen and Olaf P. Jenkins, among them – wrestling with the complex geology of the rugged mountains of southern and central Arizona. Wilson was an assistant geologist at the Arizona Bureau of Mines and working on his M.S. thesis, ‘The Mazatzal Quartzite, a new pre-Cambrian formation of central Arizona’ at the University of Arizona. In 1924 Wilson was promoted to geologist at the Bureau, where he remained, with a short leave of absence to begin his doctoral research in 1931-1932 at Harvard University, until his death in 1965. 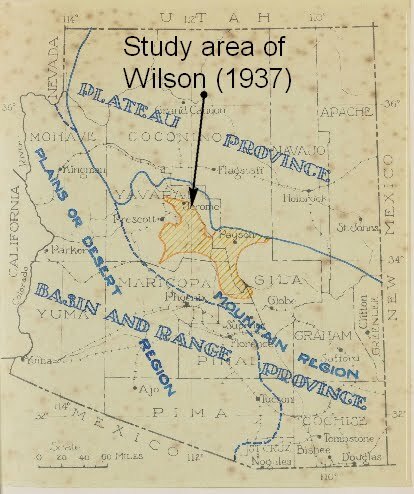 Wilson set out in 1930 to address, ‘the chief features of pre-Cambrian regional structure within part of central Arizona’, for his Ph.D. dissertation – ‘‘The Pre-Cambrian Mazatzal Revolution in Central Arizona’. His field area included the Mazatzal Mountains, Pine Creek, eastern Tonto Basin or northern Sierra Ancha, Del Rio, and the southern Black Hills areas, all of which contained extensive outcrops of Proterozoic-age rocks. Wilson concluded from his observations of the field relationships of rocks and structures that the ‘principal features of regional structure originated from a great pre-Cambrian crustal disturbance’, which he called the ‘Mazatzal Revolution’. 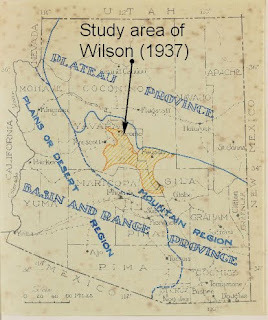 Wilson hypothesized, too, that, ‘structural weaknesses inherited from the Mazatzal Revolution may have influenced the localization of many of Arizona's prevailingly north­eastward-trending veins and the pattern of the Tertiary Basin and Range faulting.’ The orogenic Mazatzal Revolution continues to impact Arizona geology today. See James T. Forrester and Richard E. Moore’s ‘Memorial to Eldred Dewey Wilson 1898-1967’ for more about the life and times of Dr. Wilson. Note: AZGS thanks an anonymous patron who arranged at his/her own expense with Harvard University to scan Wilson’s dissertation and secure copyright permission from Dewey Wilson to re-release Dr. Wilson’s work as CR-17-C.
Forrester, J.T. and Moore, R.E., 1965 Memorial to Eldred Dewey Wilson 1898-1967. Geological Society of America Bulletin, V. 76, p. 187-191. Reynolds, S., Spencer, J.E., Richard, S.M., Pearthree, P.A. 2013, The Geological Exploration of Arizona: The Role of State and Federal Surveys and the Geologic Map of Arizona, Arizona Geology Magazine, Winter 2013. Wilson, E.D., 1922, The Mazatzal Quartzite, a new pre-Cambrian formation of central Arizona. Univ. of Arizona M.S. thesis, 40 p.
Wilson, E.D., 1937, The Pre-Cambrian Mazatzal Revolution in Central Arizona. Ph.D. Dissertation, Harvard University, Cambridge, MA, 335 p.